Activist's Escape Complicates Clinton's China Visit Secretary of State Hillary Clinton is heading to China — and into a firestorm — after a high-profile dissident's daring escape from house arrest. 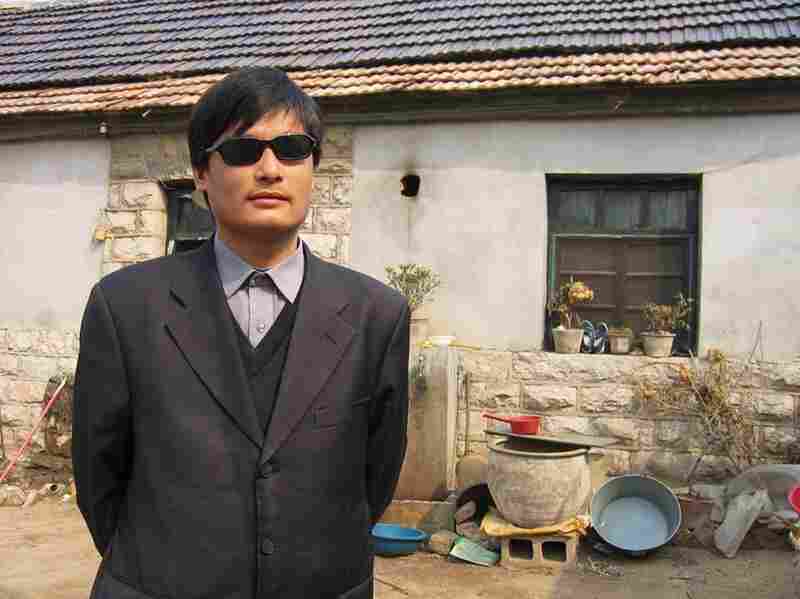 Chen Guangcheng is now said to be under U.S. protection. Human rights activists say the case is a test for both China and the Obama administration. 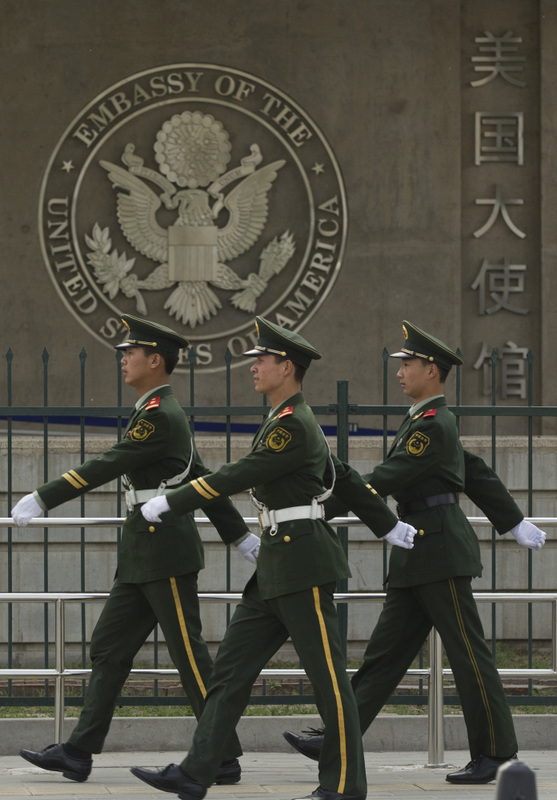 Chinese paramilitary police patrol outside the U.S. Embassy in Beijing on April 28. Chen Guangcheng, a blind legal activist who fled house arrest in his rural Chinese village, is reported to be under the protection of U.S. officials. Secretary of State Hillary Clinton is heading to China for what was supposed to be a routine visit. U.S. Secretary of State Hillary Clinton sets off Monday night on a trip that was supposed to be a routine checkup on U.S.-China relations. Instead, she is flying into a firestorm after a high-profile dissident's daring escape from house arrest. The blind legal activist, Chen Guangcheng, is now believed to be under U.S. protection — and diplomats are scrambling to try to resolve the issue quickly. On her first visit to China as secretary of state in 2009, Clinton emphasized other issues besides human rights. "We have to continue to press [China], but our pressing on those issues can't interfere with the global economic crisis, the global climate change crisis and the security crises," she said. This time around, human rights issues will certainly "interfere" with Clinton's agenda. And they should, says Rep. Chris Smith, a Republican of New Jersey. "My hope is that this week will be a game-changer for the administration, which has been very weak and enabling of the Chinese dictatorship," Smith says. "You know, hope springs eternal — this is the week to make a difference and be very strong with Chen Guangcheng." To the New Jersey congressman, the timing of Chen's escape was ideal, with so many high-level Obama administration officials descending on the Chinese capital for the strategic and economic dialogue. "Chen couldn't have chosen a better time to make his escape and to bring attention to himself, his family and the human rights abuse that he so courageously fought against, which is forced abortion and forced sterilization," Smith says. "That's why the book was thrown at him by the dictatorship with such harshness because he dared to speak out against this abuse of women." The Obama administration has raised concerns about Chen's harsh treatment under house arrest in the past. Administration officials wouldn't comment Monday directly on Chen's case. Clinton would only say she's working on — as she puts it — a "constructive relationship" with China. "Now, a constructive relationship includes talking very frankly about those areas where we do not agree, including human rights," Clinton said. She says that will be guiding her in her talks with Chinese leaders. U.S. diplomats are already in Beijing trying to resolve Chen's case. Kenneth Lieberthal, director of the Brookings Institution's John L. Thornton China Center, hopes that can be done quickly. This undated handout image provided by ChinaAid shows blind Chinese legal activist Chen Guangcheng, whose escape from house arrest is at the heart of a growing U.S.-China firestorm. "Keep in mind [Chen] wants to stay in China and is seeking from the Chinese government, at the center, an investigation of the local authorities who have been abusing him so badly," Lieberthal says. A more likely outcome, though, Lieberthal says, is asylum, but much will depend on politics in Beijing. "To me, the worst possible outcome here would be [that] the Chinese neither are prepared to guarantee the safety of Chen Guangcheng and his family in China, nor are willing to let us get him to the airport and get him out of China," Lieberthal says. "In which case, we've got a long-term resident in U.S. facilities, and we have a long-term major irritant in our bilateral relationship." Lieberthal is sympathetic to Clinton's approach to human rights issues in the past, trying to keep them separate from other tough issues, and he says this week's agenda is already "very full and serious." "This meeting may test that proposition — whether you can keep each of these in their own category so that problems in any one area don't undermine your ability to deal with the others, because all are very consequential," he says. Smith, the New Jersey congressman, though, say the Obama administration should ignore diplomatic niceties this week and make Chen's case the priority. "This is not just a test for [Chinese Premier Wen Jiabao], who talks about the rule of law and reform, but it is also a test for this administration, which has been AWOL on human rights vis-a-vis China for the last three-and-a-half years," Smith says. President Obama says his administration brings up human rights issues at every chance. But he declined to speak about Chen's case Monday.